Head beachside for magnificent views and swanky potato cakes. Upstairs at the heaving St Kilda Sea Baths, Captain Baxter sits as a ship’s captain would, staring out over the open water. 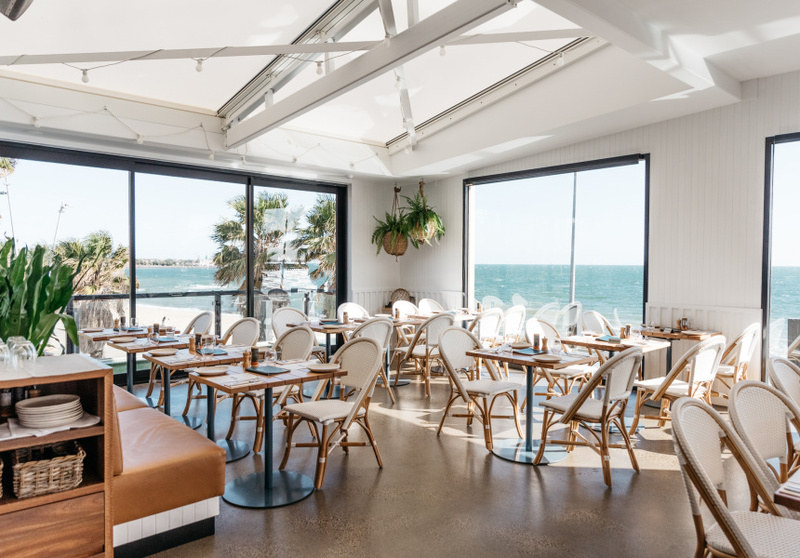 With floor-to-ceiling windows offering unimpeded views of St Kilda beach and Port Phillip Bay, and an all-new seafood-centric menu, the eatery could hardly get more seaside if it tried. In May, the Captain Baxter of old closed with a view to clean up the space and play to its obvious seaside strengths. 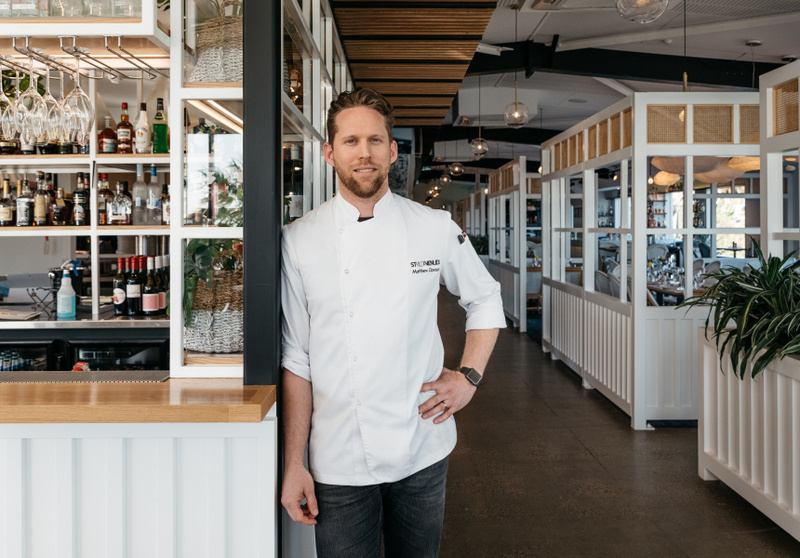 Aleksandra Savic Rakocevic of Star Architecture was briefed to create a “bahamas, bungalow, beachside” feel, according to executive chef Matt Dawson. “We want you to feel like you’re on holiday eating oysters and drinking cocktails,” he says. Dawson is co-owner, sharing duties with wife Angela, her brother Tom Doolan and his wife Amara. The group is also responsible for downstairs venue Republica, neighbour Encore and Essendon bar and restaurant Mr McCracken. That brief has been pretty much nailed – the overall vibe is of a 1920s bungalow, one a well-off mate might own. In transforming the space, Rakovic opted for sweeping white walls, cane detailing, and balustrade-less balconies in an effort to open the space up. Windows are generally set away from chairs and tables, giving diners generous views of the bay and surrounds. A retractable roof lets in yet more light, and outside there’s now a dedicated patio bar for casual cocktails in the sun. This laid-back, airy tone extends to customers too – the dress code has been relaxed to be more open to beachgoers. Unsurprisingly, the new menu is ocean-centric. Executive sous chef Timothy Martin (The European, Taxi Dining Room) joins Dawson in plating up classic beachy dishes with Asian influence. Raw tuna carpaccio comes flecked with wasabi and smoked ponzu. Golden potato cakes have loads of crunch, tempered with yuzu mayo. John Dory is steamed, bone in, and served with garlic shoots and fermented black beans. The numbing, Szechuan-spiced blue swimmer crab is “for those who want to get dirty” says Dawson. “You’ve got to fight the crab for the glory of the flavour.” You’ll also need crackers. And plenty of napkins. Dawson’s brought in a charcoal oven, too. “A lot of people are moving toward that natural cooking style of cooking over timber or charcoal,” he says. Flames lend themselves to steaks with a high marble score. A 300-gram O’Connor grass-fed rump cap with green peppercorn sauce could satisfy one person, but the marble-score-four one-kilogram Cape Grim rib eye with miso mustard is going to be a group effort. Kingfish is baked inside the coal oven on rock salt and served with sake-infused brown butter. 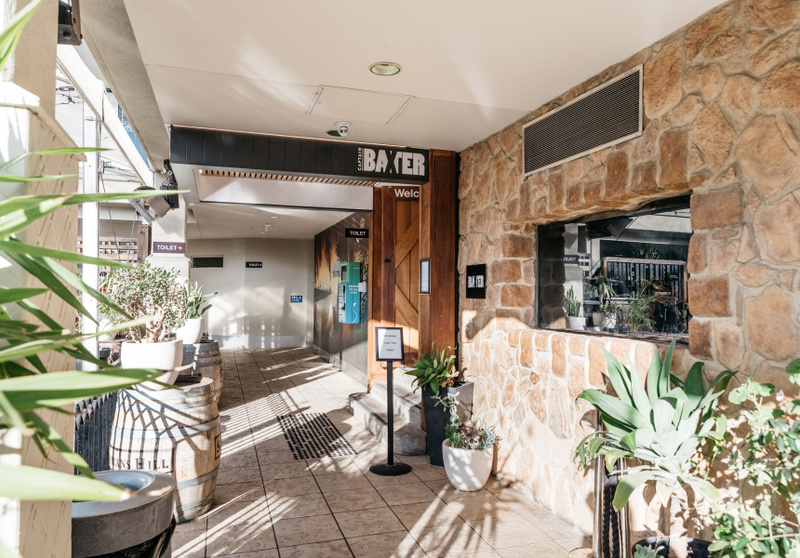 The wine list is tight and mostly local – crisp King Valley and Mornington whites that complement the seafood-heavy menu. Cocktails are fruity and bright. The Monsoon Spritzer balances Bass & Flinders's ginseng- and lemongrass-infused gin with ginger and yuzu. The Kasubi Martini combines cucumber gin with wasabi.